The Legacy of Shadow series explores the forgotten people and places in the lands of Rûl, bringing old terrors back to wreak havoc once more. 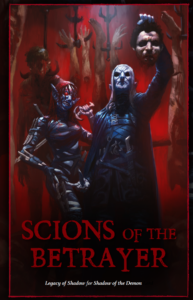 Scions of the Betrayer kicks off a new series of supplements for Shadow of the Demon Lord that reveal the forgotten peoples, places, and relics littering the lands of Rûl. In this product, you’ll find darklings, warped faeries forever bound to serve the Devil, now available to players as a new ancestry and to Game Masters as a dreadful new foe.